As promised - Yu Jing figures! Bacially the other half of the Operation Icestorm starter box. 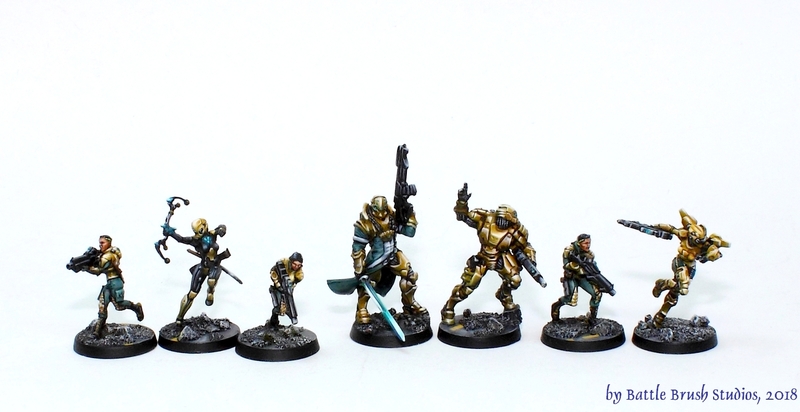 First time I ever painted Yu Jing figures. The general order by the gentleman I painted these for was "I really like the studio paintjob, but do what you think looks cool". You can see how I kinda also went for a "shiny" look on the armour parts, which is very, very interesting to do with yellow. As the contrast on the armour itself wasn't that huge I also added a good dose of turquoise/blue-green for contrast. In this photo they still were a bit WIP, mostly showing in the skin. So yeah, that's that! But fret not, I heard that more Infinity figures for these "armies" are on the way already!